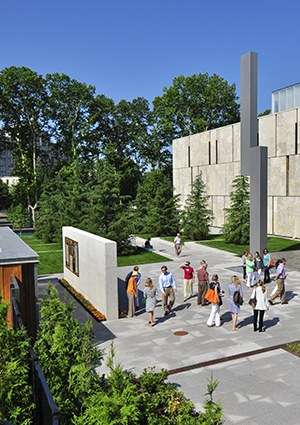 The series is based on standards developed by the Sustainable Sites Initiative™ (SITES™), a rating system and guide for sustainable land design, construction, and maintenance practices, created through a joint partnership with ASLA, the Lady Bird Wildflower Center, and U.S. Botanic Garden. “This webinar will cover the concepts of plant-soil relationships and the characteristics of soil that need to be examined for sustainable design, including: compaction, texture, soil biology, types and role of organic matter and soil chemistry. It will also discuss how to interpret soil test results and quantify specifications for soils and soil amendments (fertilizer, compost, etc.) for restoration, plant establishment and growth.” Duration: 50 minutes. irrigation schedules and site hygiene techniques.” Duration: 50 minutes. succession, monitoring of plant health, and monitoring and treatment of problematic species.” Duration: 50 minutes. To take one webinar, it costs $90 per person or $115 per group. For the entire series, each is a bit cheaper: $300 per person, or $400 per group. The center says it’s recommended that participants attend all sessions, as “content builds across the series.” Course certificates will also issued to those who finish all four. 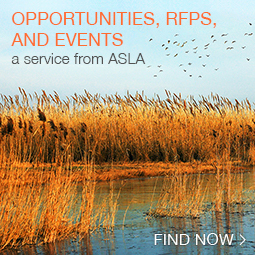 Also, ASLA members and other landscape architects can take advantage of a new online learning series hosted by ASLA’s professional practice networks (PPNs). 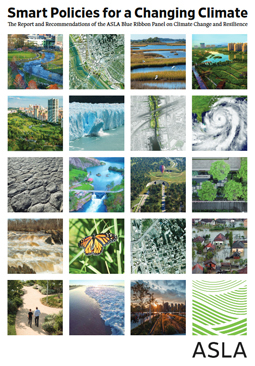 Nine online recordings of webinars are now available, covering topics ranging from 3D modeling to ecological restoration to sustainable water management strategies, all presented by experts in the field. Webinars are either 60 or 90 minutes. 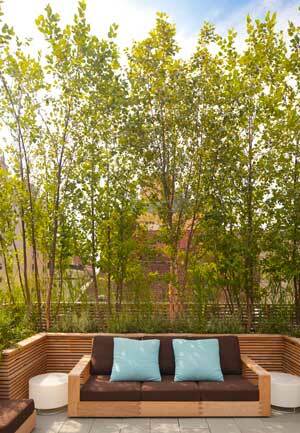 They are free to view for ASLA members; non-members must pay $75. 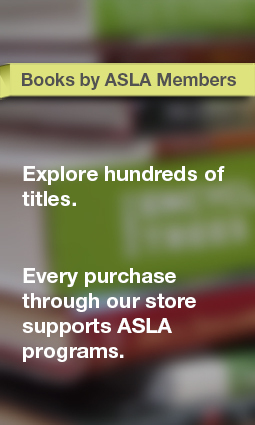 To take the test to earn professional development hours, ASLA members can pay $40 and non-members can pay $60. 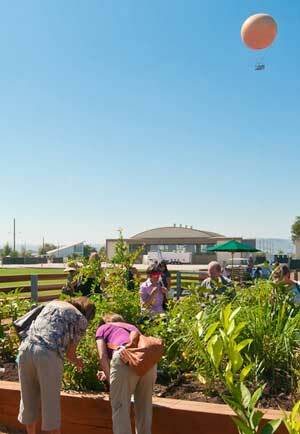 Coming in June are two new live webinars on therapeutic gardens and outdoor learning for school-age children. Another comprehensive set of recorded webinars is also coming in the fall. By that statement, Camden, New Jersey, officials mean that the city can’t widen its underground stormwater management pipes enough to carry more water and sewage. Instead, the city is taking a new approach, using green infrastructure to manage stormwater while also dealing with its many toxic brownfield sites. 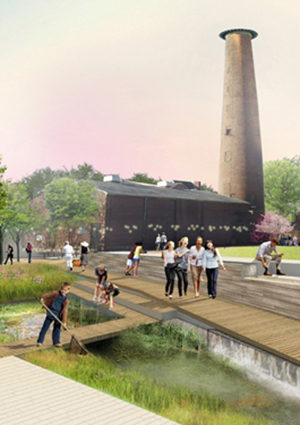 According to Frank McLaughlin, New Jersey Department of the Environment, who spoke at the E.P.A.’s Brownfields conference in Atlanta, Camden has found a new way to work, “greening brownfields” for stormwater management. Their brownfield redevelopment projects are all about capturing and using water to grow and maintain green infrastructure. This is a smart way to take advantage of clean water, because once it hits the built environment in Camden, it basically becomes toxic. Camden, a small city of 77,000, has two Superfund sites (the places the E.P.A. deems the most dangerous to humans and wildlife) and more than 100 toxic brownfields, making it one of the most polluted places in the U.S. Camden became an industrial hub in the early 1900s, but it has lost much of its industrial base by the 1970s. With that loss, population fell. On top of that, the combined stormwater and sewer infrastructure is aging. 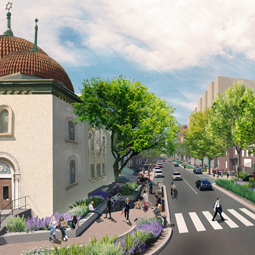 Nearby Philadelphia has shown a new way to do things, though, with its bold green infrastructure program. McLaughlin said Camden has taken up some of those ideas but also made their local green infrastructure initiative, Camden Smart, a “collaborative community benefits program.” The program seeks to reduce flooding in residential areas, but really involve the community in the solutions. Already, this bottom-up-style program has led to the capture of 1.5 million gallons of stormwater annually. Beyond this program, the city government is also taking on some of the most polluted sites, spending quite a bit of money to turn toxic waterfront drains into environmental resources. Another major project is cleaning up and capping a landfill with “clean, permeable fill.” By the contained vegetation-covered landfill, there will be a new constructed wetland, which together are expected to capture some 25 million gallons of stormwater runoff annually. The city and federal governments, foundations, and the polluters, who have been found and fined, will spend upwards of $100 million to clean up some abandoned toxic sites and restore riparian corridors. The Metropolitan Sewage District of Cincinnati serves another community that can’t widen its way out of the problem of combined sewage overflows (CSOs). While more than 700 communities have to deal with CSOs each year, Cincinnati has one of the worst problems, spewing 1.5 billion gallons of combined stormwater and sewage overflows into its rivers in just this one area. “This is one of the biggest CSOs in the U.S.,” said Mary Lynn Lodor, Metropolitan Sewage District. To comply with an E.P.A. consent decree that it clean up its act, the sewage district is creating an ambitious $193 million green infrastructure program in the Lick Run watershed. Just a 5-7-minute car ride from downtown, some 2,700 acres, much of which are brownfields, will become the site of a “designed waterway” and park that will “daylight” the buried Lick Run creek. 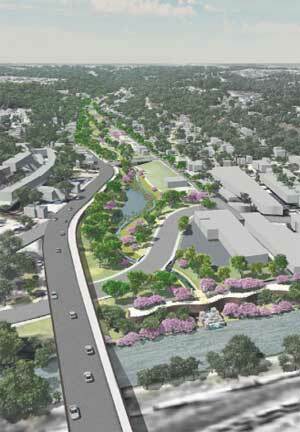 The district then worked with a team of landscape architects (local firm Human Nature), and engineers (Strand) to develop a master plan that will create green infrastructure that is attractive and user-friendly and also mitigate the stormwater management problem. “We didn’t want to spend millions on a green infrastructure system that didn’t work, like Milwaukee did,” so the team really did their research. 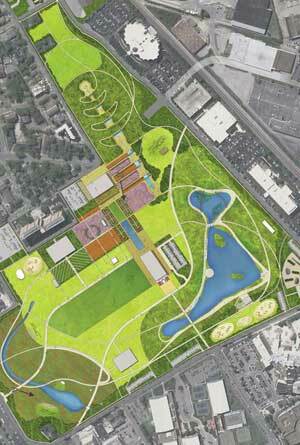 Plans for the newly green area are also expected to lead to additional redevelopment and infill, new trails, and a cultural and recreation center. Atlanta Mayor Kasim Reed said his city has taken advantage of E.P.A. area-wide brownfield planning grants to turn the City Hall East project from an abandoned site into a success. The City Hall East project is expected to transform an “eyesore” of a 2-million-square-foot distribution center just 5 minutes from downtown into a brand-new mixed-use project, with offices for technology firms, condos, and ground-floor retail. With tax credits, the private sector will put some quarter of a billion dollars into the project. City Hall East builds on a “strong legacy” of brownfield redevelopment in the city, especially the Atlantic Station project, a massive mixed-use community built on what was a highly polluted site near midtown (see image above). 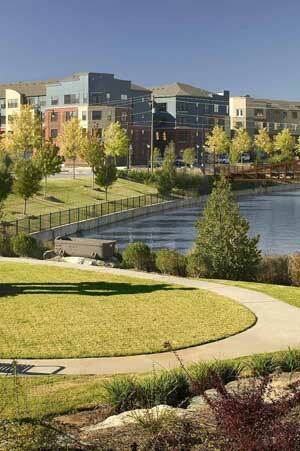 The site features loads of shops, condos, canals, and parks. Pretty impressive for an old brownfield site. The key to Atlantic Station’s success was an agreement between the local government, developers, and E.P.A. to co-finance aspects of the infrastructure, including a new bridge, which was viewed as necessary to create enough local connections to the development. But perhaps the most exciting story coming from Atlanta is the coming transformation of a 22-mile ring of abandoned rail lines that circles Atlanta, running through more than 45 neighborhoods. Those abandoned tracks and brownfield sites are becoming the Atltanta Beltline, which will offer bike and walking trails along with a new light rail network, at a cost of some $2.8 billion over 20 years. 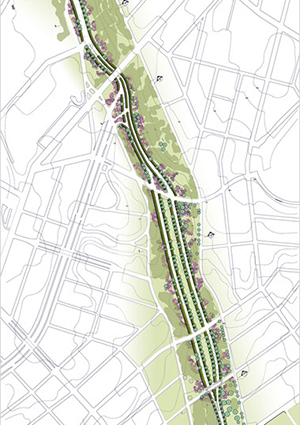 Already, the Beltline team, which includes landscape architect Kevin Burke, ASLA, has opened a 7-mile chunk of the park network. Mayor Reed said “it’s been used 300 percent more than we thought it would.” Once the project is completed, some 1,200 acres of new green space will be added to the city, and a light rail will connect neighborhoods that have been historically inaccessible to each other. A truly stunning civic project for a southern city not always known for inclusive public works, the Beltline’s first pieces, like the 4th Ward Park below, are a sign of great things to come. Other smart urban leaders also showed how to tap the private sector to make revitalization visions work. Mayor Terry Bellamy, Asheville, North Carolina, was able to convince Kraft Brewery to open a plant and offices in her town by showing them “our existing, coordinated plan” and where they could fit in. 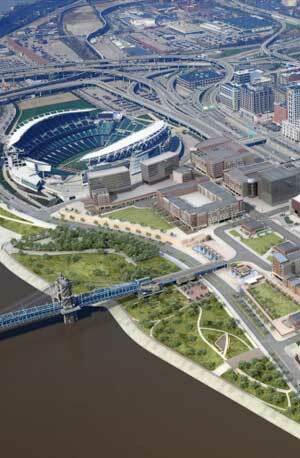 There were well-thought-out plans for riverfront revitalization and greenway development projects. She said Kraft wanted to see this first to determine how they could help with the revitalization efforts. “It was very important to them that a plan was already in place they could contribute to.” With neighboring communities, a broader regional development plan was even created to “preserve the local character” of Asheville. Interesting the town knew that to preserve the local character, they had to go think broader and go regional. 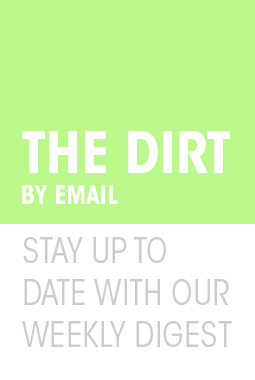 Image credit: (1) Atlantic Station, Atlanta / Cooperation Conservation America, (2) Historic 4th Ward Park / Atlanta Beltline, (3) New Porsche Headquarters, Atlanta / HOK via Dexigner, (5) Cincinnati Banks project / Urban Cincy. For decades, decentralized development resulted in automobile-centric streets, but today, cities are re-purposing their streetscapes in a variety of ways, converting them into multi-functional civic spaces. Panelists discussed how these underused or marginal areas can become integral parts of urban infrastructure, providing pedestrian mobility, valuable habitat, and other amenities. 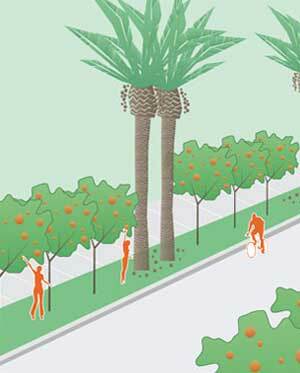 Horticulture is an important element in defining the spatial and programmatic quality of streetscapes. 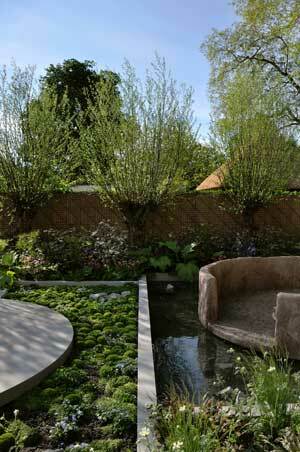 Planting mitigates scale, provides continuity and structure, and creates the aesthetic experience. 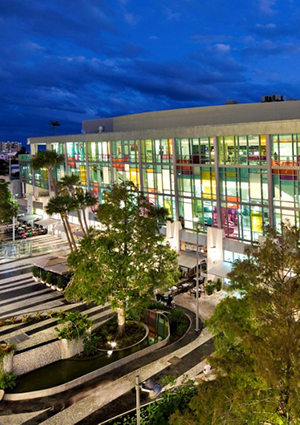 Lincoln Road may owe some of its success to contemporary attitudes toward urban space. As another landscape architect, Matthew Urbanski, principal at Michael Van Valkenburgh Associates (MVVA), pointed out, pedestrian malls were not as popular a few decades ago. When Lawrence Halprin designed Charlottesville’s Downtown Mall in the mid 1970s, retail was at that time moving out of the city centers and into the surrounding suburbs. Decentralized development did not emphasize pairing pedestrian mobility with attractive amenities. Today, as more people move back into cities and with space at a premium, developers understand the importance of grouping multiple amenities together in one place. 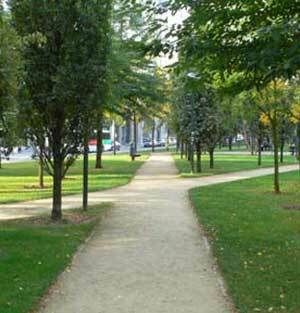 Changing attitudes are allowing for experimentation, with hybrid streetscapes combining pedestrian paths and parks into a variety of public spaces. 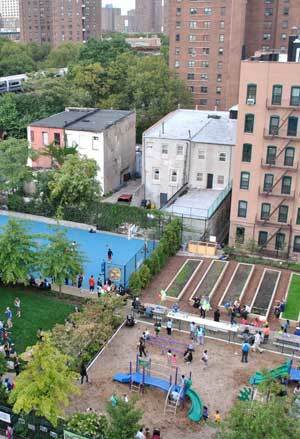 Horticulture is playing a significant role in defining the quality and program of these spaces. In addition to providing better mobility for pedestrians and bikers, hybrid streetscapes can accommodate multiple programs, such as the farmer’s market and children’s play areas. 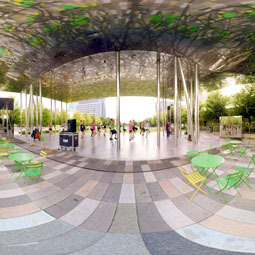 An example is the shared space in MVVA’s design for Union Square Park in New York City. 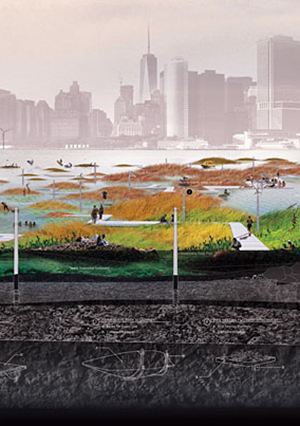 These spaces can become virtual oases and perform vital ecological functions. 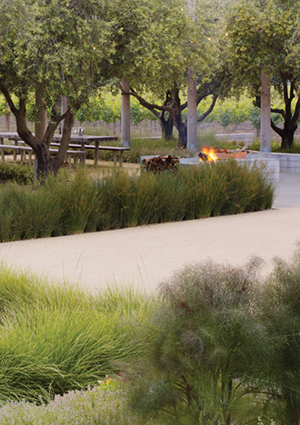 Plantings provide structure and continuity while lending character and interest. 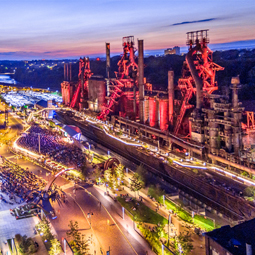 MVVA’s Allegheny Riverfront Park in Pittsburgh successfully transformed a highway “hellscape” into a two-tiered waterfront park. An abundance of native species fill the lower tier closest to the water. 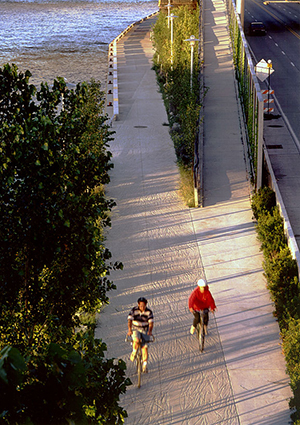 The upper tier is a transitional space planted with orderly rows of trees along paths for pedestrians and bikers. It serves as a linear plaza that bridges the city and the waterfront. MVVA is currently developing Hudson Park and Boulevard in New York, a mid-block boulevard that is both significantly wider than the average sidewalk but narrower than a traditional park. 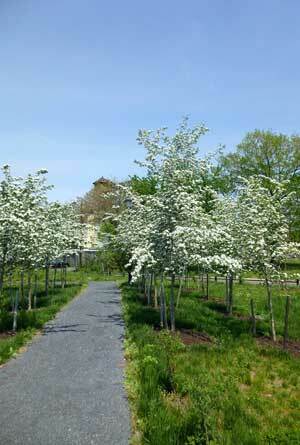 Plantings define various programmatic spaces fragmented into islands and scattered throughout the length of the park. 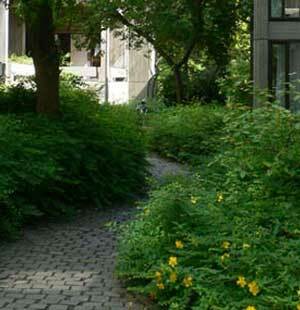 Connected via the continuous linear path system spanning the block, they provide shady, flexible green spaces. The park will be an important spine of pedestrian mobility and connectivity downtown. 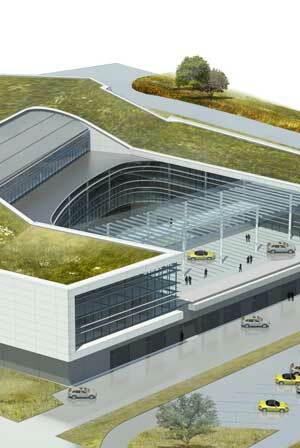 It is expected to serve as both a public amenity and a catalyst for economic development. Henry White, FASLA, a landscape architect and principal at HM White Site Architecture, also believes horticulture is critical to constructing civic spaces. 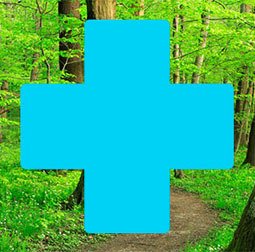 White subscribes to the biophilia hypothesis: humans have a biological need for nature and that they are attracted to certain habitats and settings in the natural world. The structure and order of natural communities evident in, for instance, the monocultures of northeast woodlands, have an appealing and comforting visual clarity. 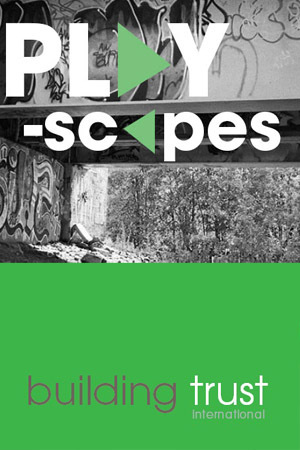 These elements provide important clues for structuring built spaces like streetscapes. White’s practice focuses on extending this design sensibility to streetscapes and other civic spaces. 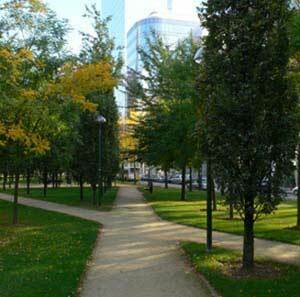 Trees, the “lungs of the city,” and other plantings are primary elements in these designs. When systematically laid out, trees structure spaces and calm the inherent urban visual chaos of their surroundings. 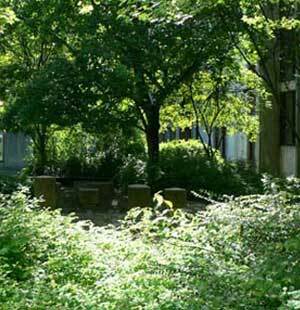 Plantings provide ecological and functional services. For HM White’s design of Oriole Park at Camden Yards, double, triple, and quadruple rows of trees organize space and direct circulation. The variety of species provide shade and interest for visitors. For the upgrade of the Mosholu Parkway in the Bronx, planted bio-filtration areas function like sponges in the unused parts of the road’s shoulder. 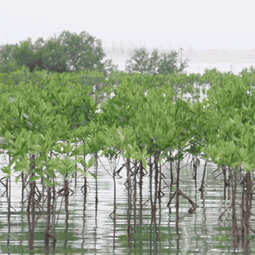 They perform a critical maintenance function while providing habitat for various species. This is part one in a three part series on the Civic Horticulture conference. 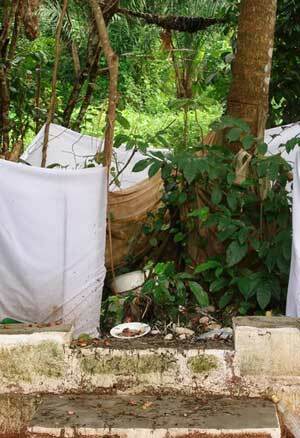 Read part two: Productive Gardens. Inspiration Kitchens in Garfield Park, Chicago, took home the Bruner Foundation’s Rudy Bruner Award for Urban Excellence (RBA) gold medal, which comes with $50,000 in support for the project. Four other projects won silver medals and $10,000. More than 90 projects were submitted from more than 30 states. 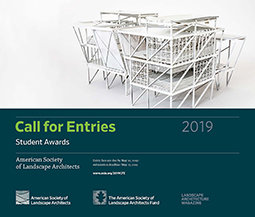 The biennial award celebrates “urban places distinguished by quality design and contributions to the social, economic, and communal vitality of our nation’s cities.” The first awards were given in 1987. Together, the Bruner Foundation has awarded 67 projects $1.2 million in support. 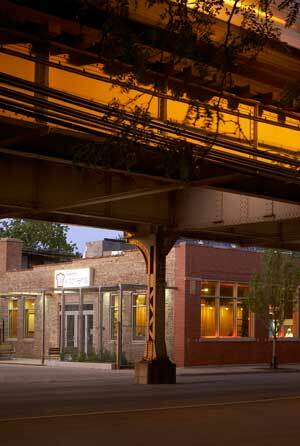 Inspiration Kitchens is an “entrepreneurial, nonprofit initiative” on Chicago’s west side. In an economically-challenged part of the city, this LEED Gold certified facility, with a 80-seat restaurant, serves free and affordable healthy meals. Shannon Stewart, executive director and CEO, Inspiration Corporation, said: “We are proud of our success in creating meaningful connections in Garfield Park and are grateful that the award will help us continue to engage with members of this under-served community.” Inspiration Corporation provides social services to Chicagoans hit by homelessness and poverty. 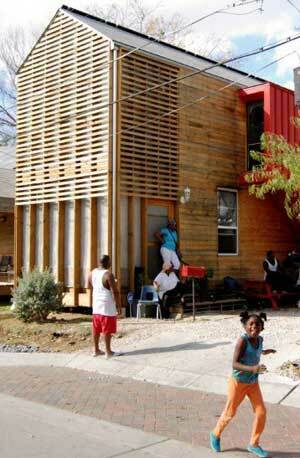 The Congo Street Initiative in Dallas, Texas, by buildingcommunityWORKSHOP, a non-profit community design center, rehabilitated five houses and constructed a sixth for transitional housing. The housing is LEED Platinum-certified. A green street was created in collaboration with the residents. Learn more about this project at Metropolis. 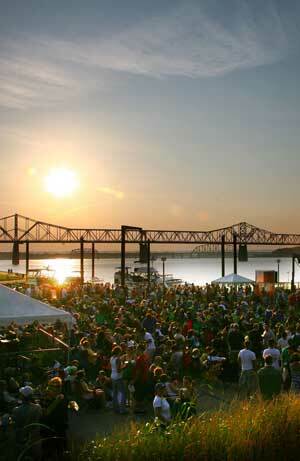 Louisville Waterfront Park in Louisville, Kentucky, is an 85-acre urban park that re-purposed industrial land and connected the city with the Ohio River. 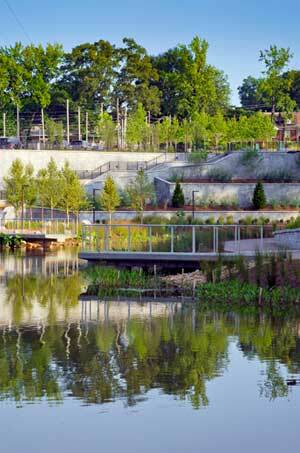 The Urban Land Institute (ULI) recently named it one of the ten best parks in the country. Landscape architecture firm Hargreaves Associates created the master plan for the park and also designed the Lincoln Memorial there. Learn more about this project at Metropolis. 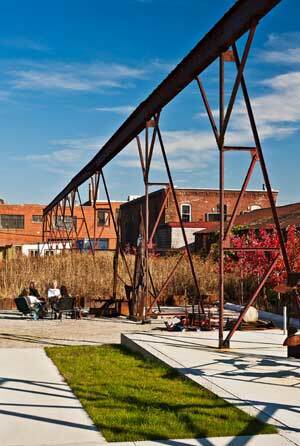 The Steel Yard in Providence, Rhode Island, designed by landscape architecture firm Klopfer Martin Design Group, is one of the more interesting urban parks to appear in years. 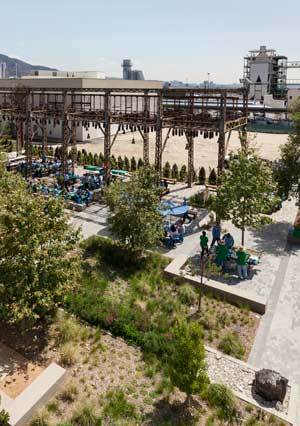 The 3.5-acre park in a transformed historic steel fabrication plant won an ASLA professional design award in 2011. The non-profit that runs the site offers a range of creative classes and events. Learn more about the park. Lastly, Via Verde in Bronx, New York, by Jonathan Rose Companies and Phipps Houses, is a 222-unit, LEED Gold certified, affordable housing development. The project has won numerous architecture awards. 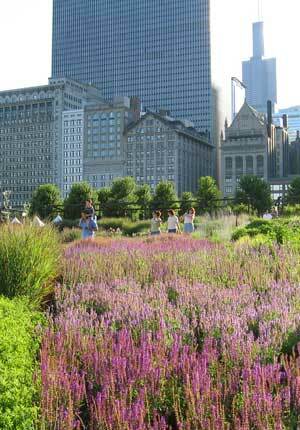 The landscape architecture was created by Lee Weintraub, FASLA. Learn more about this project at Metropolis. The 2013 RBA selection committee included: Mayor Mick Cornett, Oklahoma City; Ann Coulter, Owner, A. Coulter Consulting; Walter Hood, FASLA, Principal, Hood Design; Cathy Simon – Design Principal, Perkins+Will; Susan Szenasy – Editor-in-Chief, Metropolis Magazine; and Jane Werner, Executive Director, Children’s Museum of Pittsburgh. Learn more: A blog series on Metropolis’ web site is chronicling the 2013 RBA process, and later this year the Bruner Foundation will publish a book of case studies on the winning projects. Sentebale means “Forget Me Not” in Sesotho, the language of Lesotho, a small, landlocked kingdom in the Drakensburg / Maluti mountain range of southern Africa that has a population of around 1.8 million. 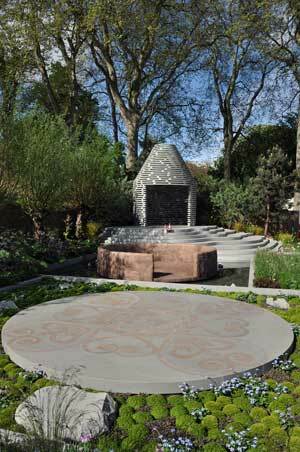 According to a press release, the Forget-Me-Not theme was central part of the partnership and garden. 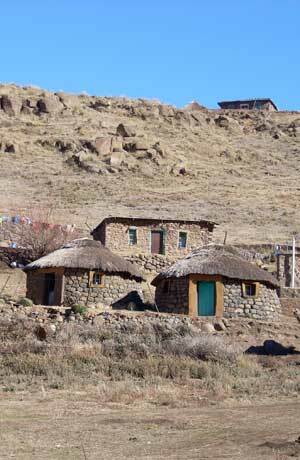 Lesotho is sometimes described as the Forgotten Kingdom, and those kids could certainly be easily forgotten by the global community. 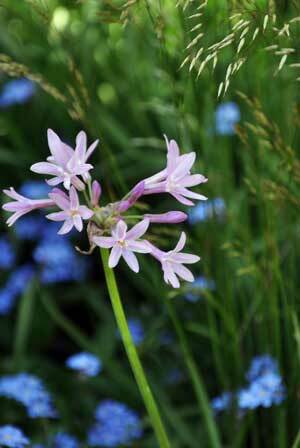 Of course, Forgot–Me-Nots are featured in the garden, woven in with anthriscus, poppies, and other plants, like Silene Fimbriata, a native of Lesotho. 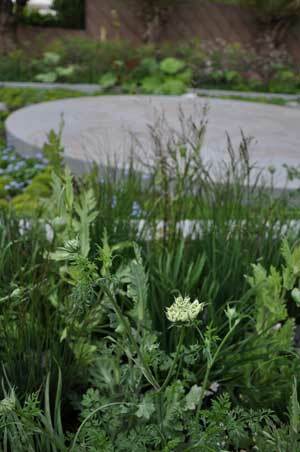 On working with global superstar, Prince Harry, Blom said he was a “very detailed, conscientious person – he wanted to know everything about the design – and in that he reminded me of his Pa.” Blom said he was so focused on the details because he sees the garden not only as an important awareness-building tool for his charitable work but also as an homage to his mother, Princess Diana. 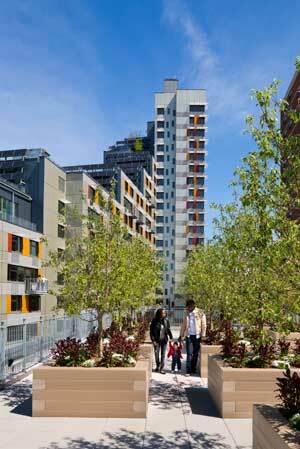 Learn more about Blom’s work in this ASLA interview. Throughout history, cultures around the world have created the concept of the evil forest, a dark, scary place where bad things happen. In Europe, these were places where witches or wolves (or even werewolves) attacked the lone passer-by. In Igbo areas of Nigeria, the Ajofia, or bad bush, still exists in some communities, although they are rapidly disappearing with development. 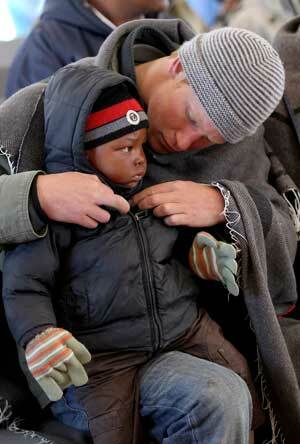 Their potency to scare the population into line has also faded with younger generations. In these places, the traditional culture that created them has transformed in the face of modernization and a growing consumer culture. In a session at Dumbarton Oaks’ conference on cultural landscapes in Sub Saharan Africa, Ikem Stanley Okoye, University of Delaware, explained why Nigerians should start thinking about preserving some of these unique cultural landscapes. Okoye said in contrast to what European colonialists in Africa believed, Africans did produce landscapes that were visual representations of complex concepts. Europeans believed that Africans were “not invested in their landscape,” and really had no indigenous landscape art or architecture to speak of. “Africa was contrasted with the West, which was viewed as having thought-out philosophy, landscapes, and architecture. Africa art was never seen representing landscapes.” This belief was convenient because it enabled colonialists to then occupy and ransack local resources for their own use. Indeed, those powerful landscapes that Europeans were clueless about are still shaping the culture in Nigeria. In Okija, a Igbo traditional village in the Anambra state of southern Nigeria, priests were arrested in an Ajofia in 2004 after 30 plus corpses were discovered at the site. Amid fears of human sacrifices, the police rushed in and destroyed the forest shrines. The entire “visually spectacular raid whipped up a media frenzy.” There was “intense anxiety” about another “traditional eruption,” which, ironically enough, said Okoye, was how Western missionaries used to respond to aspects of traditional culture. The Nigerian media and much of the public basically rushed to judgement, said Okoye. The criticism was, “why can’t they use their forests like other communities use theirs?” He thinks the priests involved “probably did nothing illegal, or beyond their own traditional Igbo norms.” It’s unlikely that missing persons were killed and buried there; more likely there were burials according to Igbo traditions over many decades. But what really shocked Nigeria was the hidden list investigators found, which showed how many of Nigeria’s rich and powerful were somehow involved. “There were scores of names, from governors to chiefs of police.” There were very public firings of officials found on the lists, and the president eventually had to intervene to protect some careers. Okoye then wondered whether the Ajofia, which was viewed as powerful because of its “impenetrable secrecy,” actually had any efficacy to keep people in line anymore, particularly given the harsh media condemnation. Almost ten years later, the Nigerian press is still interested in the story. It’s also only a place priests can go. “They can enter and leave unharmed.” Once in the forest, they harvest plants, roots, and herbs to make traditional medicines that help ward off evil. “For everyone else, this is a fearful place, a place to be avoided.” And to this day, the cinema of Nigeria, which is often called “Nollywood,” often features horrifying forests with witches. Funnily enough, Okoye said when the European colonialists arrived, the Ajofia were the first land the Igbo gave them, so to this day, you often find churches within Ajofia or next door, simply because they carved a road through what was previously a larger evil forest. The early Christians simply didn’t care that the land was deemed tainted.